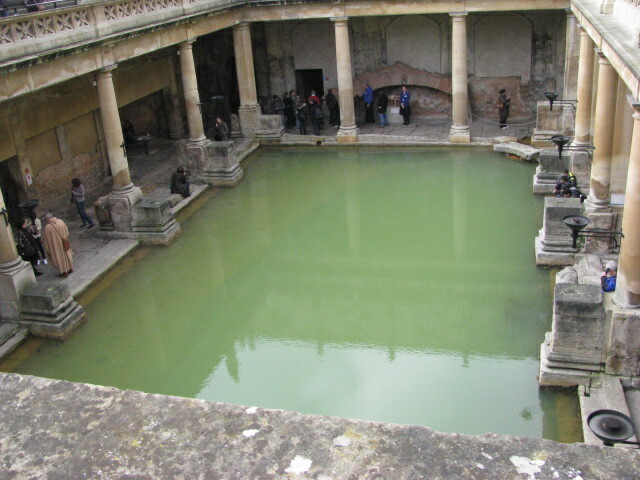 We didn’t have a lot of time to spend in Bath, but I made sure to visit the Roman Baths in this delightful town. 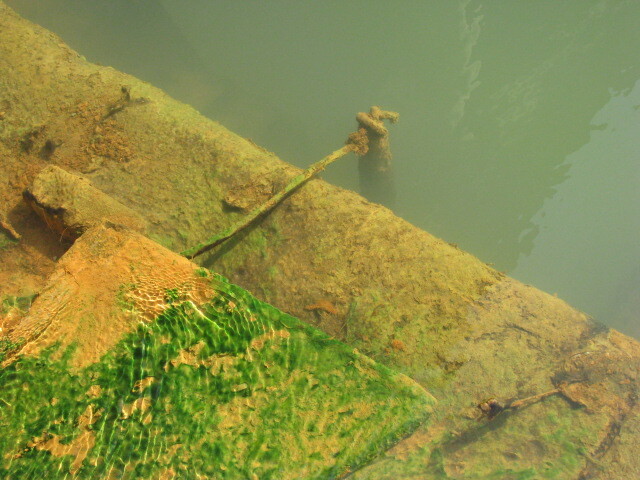 The baths are well-preserved and are a kick to wander around. More than one million visitors pop in each year. 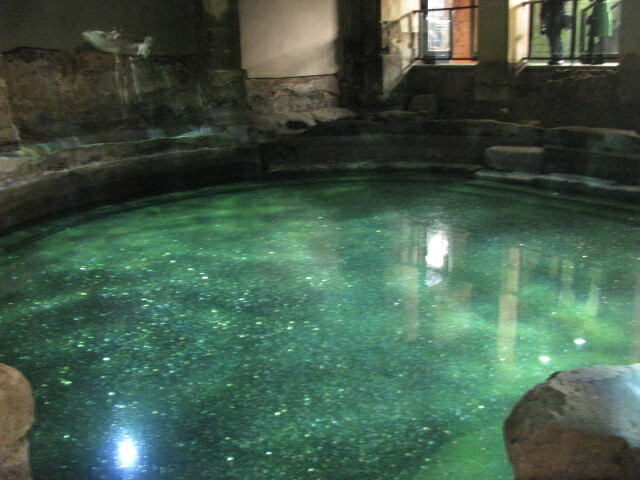 Most of the baths are located under the streets. 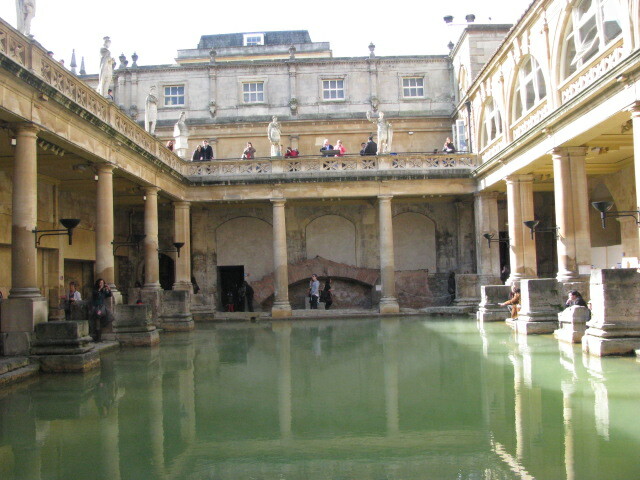 The bath pictured below is just a fraction of the Roman Baths during their heyday, roughly 2,000 years ago. 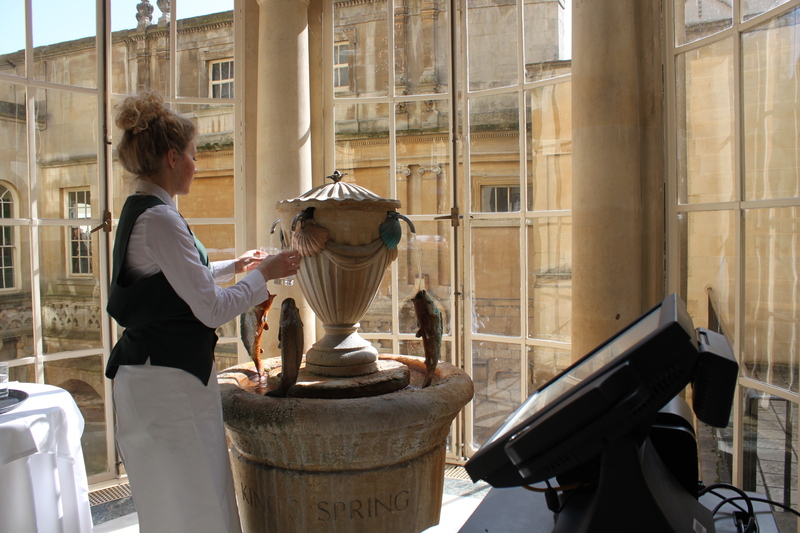 In addition to seeing the baths you can visit the Grand Pump Room, where you can eat in the restaurant. Also, you can sample the water from the warm spring. 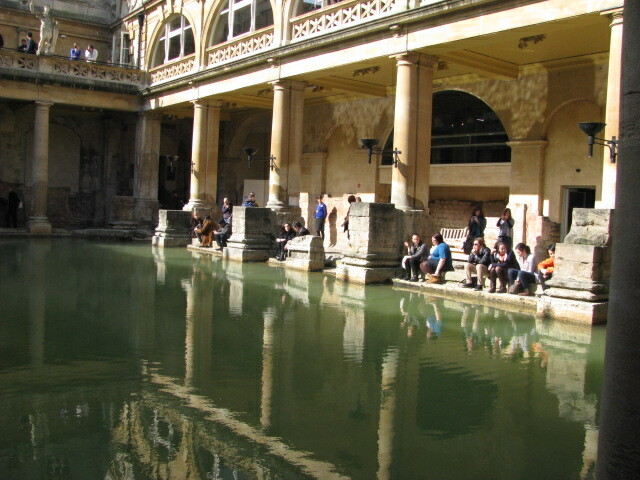 If you would like to plan a trip to the Roman Baths check out this link. 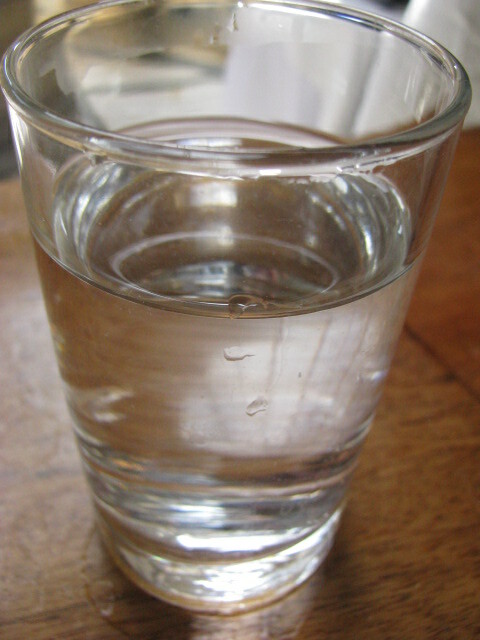 Here is my sample of the water. It had a strong smell and a slight metallic taste. It wasn’t the best water I had. And it wasn’t the worst. But I couldn’t leave Bath without trying it. 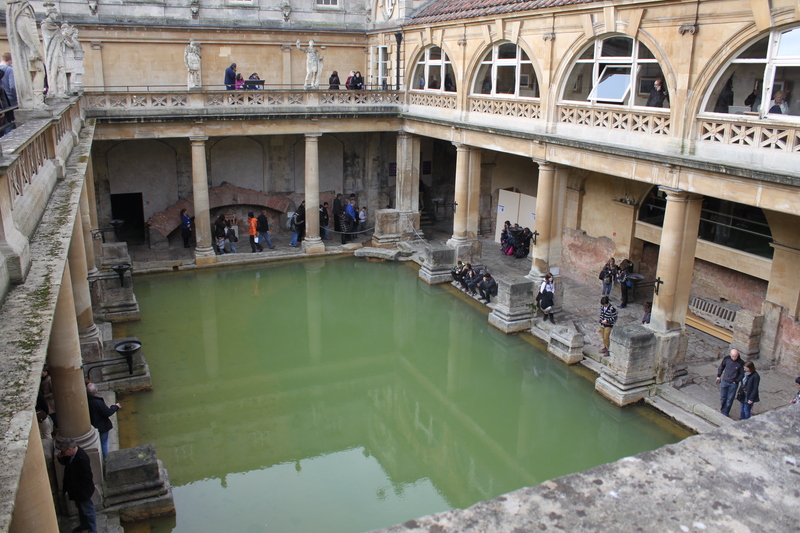 This entry was posted in Travel and tagged Bath, England, English History, Grand Pump Room, Photography, Photos, Roman Baths, Ruins, Tourism, Travel. Bookmark the permalink. 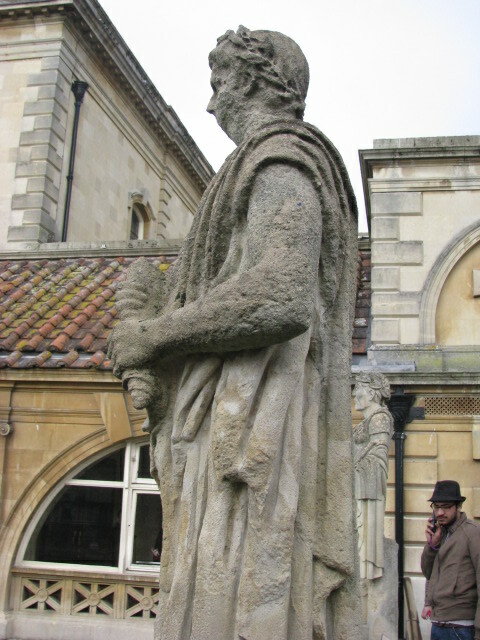 I’ve been to Bath but I haven’t visited the Roman baths, unfortunately. It is a very beautiful place though, isn’t it? Lovely architecture. I really enjoyed seeing it. It was fun walking on the sidewalks where Romans walked 2000 years ago. History nerd paradise. It is so lovely. I must go back and visit the baths some time. Thanks Nia! I loved seeing the pool and the reflections on the water. Next time… we’re so going there!! You should go! And don’t forget to sample the water. We shared a glass since I didn’t want it all. Can you get Charlie to drive all of us 🙂 You would love Bath. Such a quaint town. Thanks Xandi! I hope all is well. Wow, nice photos and what a treat to see this! It looks like they are very well preserved. Did it make you feel like you had travelled back in time? One day I have to get back to England. I keep realizing how many things I missed seeing while I was there!! I did picture myself back in Roman times! If you come back here we should have a drink! There is so much to do here…such an amazing country. I hope you had afternoon tea in the pump rooms, one of the best places to have one of the nicest English treats! Unfortunately we didn’t have time. I’m hoping to go back to Bath and spend more time there. I didn’t even have time to visit the Jane Austen center, but I want to do that after I finish reading her novels. That would be really odd to bathe there. Not sure if I could do it unless in a bathing suit. Thank you for sharing this time with us. How gorgeous… such wonderful inspiration…. 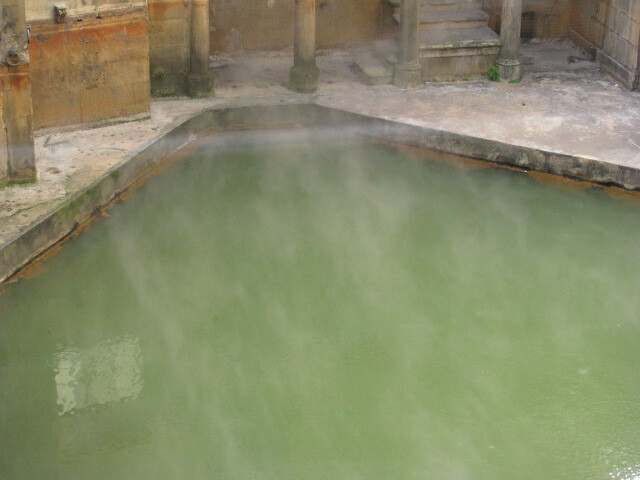 It would be a cool place to write a scary short story…ghosts, Romans, and scalding hot water. We will soon be launching our Photo Journal section this March. Very excited for it as well. Thanks for being our inspiration. Thanks for providing the link to the book. It sounds like a delightful story and I hope my library has a copy! I’m pretty excited about the Photo Journal! Can’t wait to see it…I love seeing photos from all over. This world is amazing, filled with so many beautiful places, people, and animals. Exciting! LOL…I didn’t consider the latter part. I loved the architecture. The Romans sure knew how to build! I haven’t seen the TV series Spartacus. The movie Spartacus is coming up on my movie list soon. It was really fun to wander around there! Your photos are almost exactly like mine when I visited 5 or 6 years ago. Of course yours are much better! The part I thought was so interesting was if someone had treated you badly, you would write their name on a piece of silver or tin and then toss it into the water and hope the goddess would avenge your mistreatment. I’m sure your photos are beautiful! Do you think that goddess still has her powers? I might have to go back 🙂 I hope you do get to go back. I know I want to see the Austen sites and have more time to see the town. I thought it was a cute place. And I hear their rugby team is quite good. It would be fun to watch them. Glad you enjoyed them. I’ve been enjoying your trips on your blog. Wow! You’ve been to some beautiful places. Oh, how interesting. Seems to be awesome place. I have never heard about this place, so thank You presenting it. It is a really interesting place to visit. Thanks for stopping by! Never mind the gorgeous shots.. the title alone rocks hard!